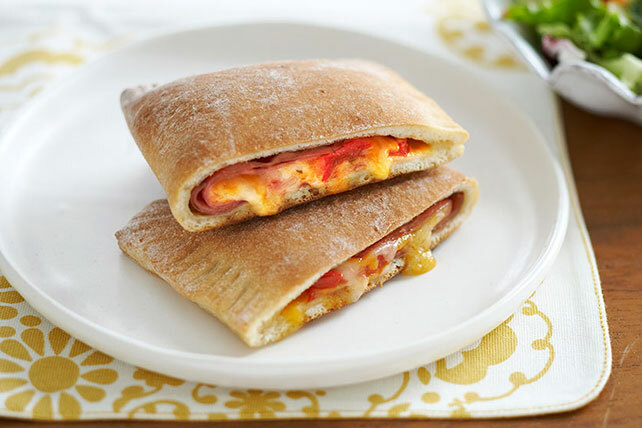 Use refrigerated pizza crust to make this awesome Ham 'n Cheese Calzones Recipe a breeze to make. This calzones recipes will make you look like a genius. Unroll pizza dough onto lightly floured surface; press into 18x12-inch rectangle. Cut into 6 rectangles. Top with ham to within 1/2 inch of edges, cutting ham slices as necessary to form even layer. Combine cheese and dressing; spread over ham. Top with tomatoes. Fold dough rectangles crosswise in half; seal edges with fork. Place on baking sheet sprayed with cooking spray. Bake 15 to 17 min. or until golden brown. After placing calzones on baking sheet, sprinkle each calzone with 1 tsp. KRAFT Grated Parmesan Cheese, then bake as directed. Preparing using KRAFT 2% Milk Shredded Colby & Monterey Jack Cheeses and KRAFT Lite Ranch Dressing.